The IHG devaluation 2019 was supposed to have gone into effect yesterday, but somebody leaked the devaluation list, and now it’s been postponed until January 25. It’s kind of funny how these leaks find their way into the public domain – if memory serves me, the IHG devaluation 2018 list was also leaked around the same time last year. Coincidence? I could’ve vented and ranted about the newest IHG devaluation, but I will not. Been there, done that. IHG keeps making its loyalty program more and more irrelevant, which, to be fair, is fully consistent with what they’ve been doing in the last several years. Basically, IHG would ease up on destinations few people want to go to, while making you pay more for more popular locales. I don’t believe the quality of affected accommodations had anything to do with their decision process. Here are some tidbits (HT: Lionheart on Flyertalk). There are 696 properties which are having their points requirements changed on January 14th. 570 i.e. 82% of these properties are increasing in points value. Approximately 440-450 of the hotels affected are in the U.S.A. The average property value is changing from (an average) of 24,000 points to 27,180 points. There are no new 70,000 point properties. There are no properties >70,000 points. As I promised, I’m not going to yell, vent, or rant. Instead, I’ll just calmly inform you that 99.9 percent of the places on this list – where you might actually want to go – are going 5,000 points up. Not a huge increase until we remember that last year they already devalued about the same number of hotels. And the year before. And the year before that. And their most important credit card benefit – a free night at any hotel in the world – was replaced with a lame free night at an up-to-40,000-points hotel. Well, this 2019 IHG devaluation makes their last year credit card devaluation even worse. Here are the hotels where you won’t be able to book your free night after 1.25.19 (so book now). There are also some good news for frequent travelers to Caracas, Venezuela. Your suitcase of bolívars is about to go farther now that InterContinental Tamanaco Caracas is moving down from 30,000 to 25,000 points. What do you mean – not good enough? Come on, people, stop pushing your luck! I’ve found very few sweet spots created by the recent changes, but all these places are worth visiting even if Mexico City, Belgrade, and Hanoi are not considered touristy. I value IHG points roughly at $0.005 per point, so the sweet spots above meet my criteria. There is a good chance that using points at these hotels might get you a better value than paying cash. If you’re planning on staying at one of the above properties – wait for 1.25.19. IHG has increased redemption levels for about 80% of its U.S. hotels on the list. They started weak by moving Hotel Indigo Birmingham Five Points S – UAB, Alabama, down from 30,000 to 25,000 points, but picked up steam right after that. 6 up – one down, 26 up – one down, 13 up – one down, and so on and so forth, They’ve run from Alabama to New York, generously sprinkling additional 5,000 points on almost everything in sight until they got to the letter “O”. At which point, something broke inside them (I guess). 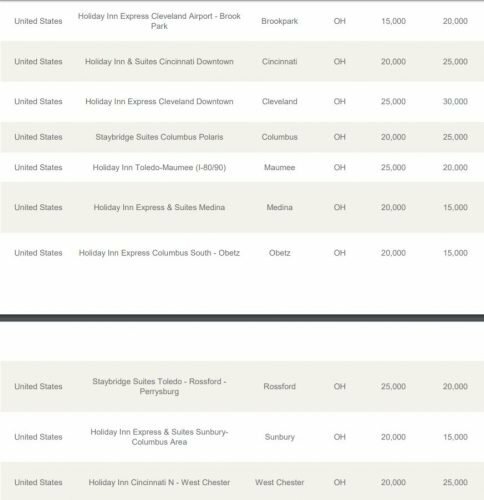 Out of 10 IHG Ohio hotels 5 moved up and 5 moved down. I’ll bet Ohio never saw it coming. Oklahoma did even worse. 4 hotels moved down, and only one moved up. I’ll bet they never knew what hit them, either. On an unrelated note, Alva, OK gave me a strange sense of déjà vu. At first, I hadn’t been able to place it, but then it dawned on me! Anyhow, after IHG “decimated” Oklahoma, it picked up again and finished the alphabet on a very “positive” note: 119 up – 26 down. Very funny! I will laugh/cry with you! IHG, what happened to you, my love? Is there a list for what is eligible for the 40k free night? What’s the best mileage route from Hangzhou to Caracas to take advantage of this steal? Seriously though, I always aim for the low end uses so IHG, Hyatt, and choice are my top chains. Hilton always wants 35-40 any city I visit, Marriott usually does too, and Radisson typically doesn’t exist. I’m with you on this. I don’t like wasting points any more than wasting money unless I need my stay to be special — and even then, I often prefer an upscale rental to a hotel. Andy, at this point, should I even keep paying the annual fee on both mine and my wife’s cards with this deval? Sam, it’s a loaded question. To me, it would still be worth it for being able to extend my award stay (4th night free plus 2 free Chase nights), but I don’t mind a Holiday Inn. What’s your family travel pattern? If you don’t stay at “lesser” hotels or travel off the beaten path (PointBreaks), then I’d save the money.